Learning is automatic. 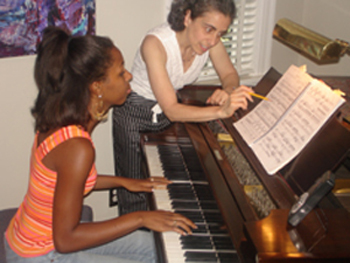 The experience of the music lesson itself makes a lasting impression on a student. If you come to your lesson with an open mind, the stage is set for dynamic learning throughout the week. Music is meant to be played, not worked to the bone. Don't be a perfectionist! Have fun and you'll get good results. "Rome wasn't built in a day." Don't expect to make big changes overnight. A good attitude, applied little by little, ensures future improvement. Ask for help. If you get stuck, someone at home might have the answer. You can always phone your teacher if you need to. Short practice sessions are best. Youngsters can accomplish a lot in a five-minute review. Depending upon the individual, older students can also benefit from several short practice periods versus one long one. Look over your lesson assignment soon after your lesson. Your memory will be solidified and you'll feel more confident about completing it than if you wait until the last minute. Organize your practice session. Make a decision on what you want to accomplish. Do the easiest things first. Only practice what you feel like doing, unless you're in the mood for a challenge. Guitar and Piano Practice Directions can be found in your books. Follow them step by step. Younger Voice students "practice" throughout the week every time they use their speaking or singing voices. Students will continue to make new mental connections with each practice experience. "Practice makes perfect!" Don't just hack away at something, repeating the same mistakes over and over. Sometimes merely sitting and thinking about perfect practice can make all the difference. Take your time, relax and breathe. Imagine your beautiful music before you actually play or sing it.